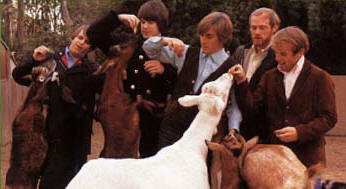 Pet Sounds was something entirely new to the ears of the touring Beach Boys. Brian, newly married and newly experimenting with drugs, had free rein to write what he chose. The name Pet Sounds actually comes from derogatory comments made by other group members in reference to the music Brian had made. THIS was not an album about surfin' and cars...here was something far, far deeper than that - an exploration into the heart and soul of a young American...a hymn to the joys of young love and an insight into the depression felt when it goes wrong. The American public were slow to accept the new Beach Boys sound. The album charted in a lower position than previous albums then proceeded to gain a very unfairly low reputation - and although subsequent history was to value the album much more highly it took a full 35 years before Pet Sounds was universally acknowledged for what it was: one of, if not THE best pop album in history! The UK took to the album straight away, however, and an indelible link was forged between Brian Wilson and the British public that still lives on nearly 40 years later. The Beatles certainly loved Pet Sounds, Paul McCartney has repeatedly cited it as his favourite album and put on record the fact that it inspired future Beatles albums like Revolver and Sgt Pepper. Heartbroken by the lack of instant universal acclaim Brian turned further away from the rest of the group. His increasing use of psychedelic drug LSD led to some increasingly perverse behaviour: the installation of a tent in his front room, a sand-box to sit the piano in 'to recreate the feeling of the beach', meetings scheduled to take place in a swimming pool. Brian met young composer/lyricist van Dyke Parks and began to write new songs. His mother Audree had often spoken to Brian about special 'vibrations' dogs could 'pick up' and the seeds of a new song came from this. 'Good Vibrations' was to change Brian's life for ever. The song took over 6 months to complete, an unheard of thing back then. Even the other BB were impressed by its grandeur although it underwent many incarnations of structure and lyrics before release. 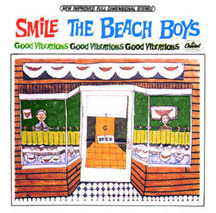 It was the hit that should have relaunched the Beach Boys as major chart artists...but it didn't! Capitol wanted an album to follow up the single's success but it never came. Brian wanted his next album to be a 'teenage symphony to God'. 'Dumb Angel' was its working title and it was to be an album of humour, Americana and love, centred around an epic, 4-part suite called 'Elements', dedicated to Earth, Air, Fire and Water. But Brian's by now seriously fragile psyche was in constant need of reassurance and support...all he got was ridicule and criticism - and SMiLE became the most famous 'non-album' of the next 3 decades. Finally abandoned in 1967 SMiLE was reportedly never completed - at one point Brian even claimed he had burnt all the tapes, something we now know is certainly not the case. A quick album of bits and pieces was rushed out - to a very poor reception and Brian withdrew from the Beach Boys almost totally, not returning fully to the group until 1976.